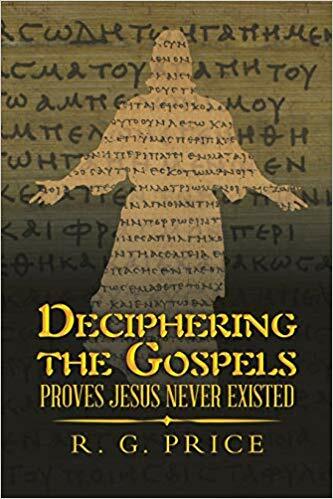 And while we’re looking at updates to recent books, R. G. Price has an informative webpage for his book Deciphering the Gospels. It’s an active page, too, meaning Price is regularly adding to it in responses to common criticisms. Click on the image to pay a visit. 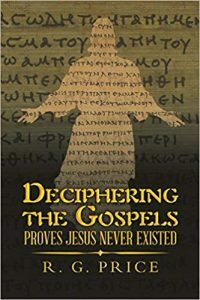 I have posted a review of R. G. Price’s book , Deciphering the Gospels — proves Jesus never existed, arguing for the Jesus of the gospels being an entirely literary invention on Amazon. At the time of this post it has not yet appeared but I expect it will be processed and published soon. I have posted a copy of what I wrote below. Meanwhile, I have been persuaded I should also do my own review of Richard Carrier’s book On the Historicity of Jesus. It’s a big book and the review will be lots of work so it won’t be completed by tomorrow but it is in the “to do” basket.